To call anything involving Markelle Fultz "surprising" at this stage of the game is to basically be ignorant of the last year of developments in his saga. Pretty much anything is on the table these days. A falling out with the trainer who claimed he was going to rise to an All-Star level? One of the ugliest free-throw attempts we've ever seen on a professional basketball court? A report about him supposedly being involved in a motorcycle accident? Those things all happened in the span of a month. So how do you surprise the world with any Fultz news at this point? By catching your own team off guard, evidently, as Fultz did on Tuesday morning. And GM Elton Brand made it abundantly clear the newest decision regarding his health was directed by agent Raymond Brothers, not the team. "I spoke to Raymond Brothers this morning and he stated that his recommendation was for Markelle to see a doctor in New York for a consultation," said Brand. "He will not practice or play in a game until he does that. I said, 'Okay, when is that?' He said it was Monday. Then we got off the phone." "This was brought to me by Markelle's agent this morning," Brand continued. "We've been aligned, we've allowed Markelle to see many specialists at our recommendation and Raymond's recommendation. His agent's recommendation, that's who Raymond is. Raymond's job is different than my job. Raymond's job is to do what he thinks is best for his client. My job is to continue our positive trend and try to get deeper into the playoffs." Brand did not appear happy to be talking about this saga with reporters the night after a win against Phoenix, with the team on a three-game winning streak and trending in the right direction post-Butler trade. Who could blame him? He took a pair of nice role players left to him by previous regimes and turned them into a legitimate star in Jimmy Butler, and all anyone is interested in talking about right now is the backup guard who can't seem to figure things out. The rookie GM never wavered in the team's support of Fultz, but it was clear from his demeanor and his words that Brand and Brothers are on different pages. Brand even pointed out Fultz's appearance in front of the media on November 6, where Fultz told reporters his health (and specifically his shoulder) were just fine. "You ask him, he says publicly on the record — we didn't push him or say, 'you have to say this' — he said he feels good. There's nothing that we saw medically that didn't allow him to play," said Brand. "He played last night, he played two nights ago. Ever since Jimmy Butler came and he wasn't starting, I felt like he played pretty well. I was proud of him and the way he bounced back from a lot of things." The timing, of course, is worth scrutinizing. Had this happened after one of the games over the last week with Fultz playing well in a bench role — he offered solid minutes against both the Utah Jazz and Charlotte Hornets over the weekend — there would have been genuine concern about his future from just about everybody, fans and media alike. But Brothers has done his client no favors moving forward with this action now. 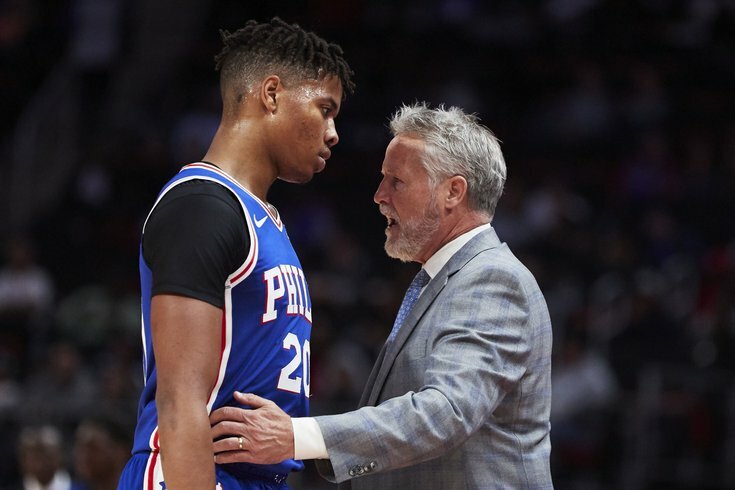 During Monday night's game, Markelle Fultz was all set to check in for the final 27 seconds of the first half, and was even announced by PA announcer Matt Cord before being yanked to the sideline by Brett Brown. T.J. McConnell took his place for that brief cameo before half, and took all of the backup point guard minutes in the second half of the win over Phoenix. After the game, Brown left the door open to name McConnell the backup point guard for the rest of the season (as documented in our story earlier), and Fultz later sent a seemingly innocuous tweet that now looks like a hint of things to come. "Do I find the timing odd?" Brand asked rhetorically when questioned on Tuesday. "Whatever Markelle wants at this time, his timing, it is what it is." Both Brown and Brand tried to skirt around the idea of this being a reaction to McConnell grabbing his minutes last night ("It would not be fair for me to speculate," said Brown), with Brand leaving a little more wiggle room for interpretation in his response. PhillyVoice: Did Raymond give you any indication, speaking of T.J., last night specifically had any impact on this decision and the timing of what happened? Brand: That was the first discussion was what was going on. I had a follow-up conversation, and we did speak a little bit about on-court stuff but I was focused on the medical right now, I said let's just focus on the medical and how we can support Markelle. This chain of events makes Brothers' power play look like a desperate attempt to flip the narrative that Fultz could lose minutes to McConnell, but if anything, it has gone the opposite way. Benefit of the doubt is eroding. And before the media could even leave the practice facility on Tuesday, Philly.com's Keith Pompey reported that Fultz was still in the gym with teammates despite previous insistence that he would be sitting out of practices and games until visiting with a specialist. Markelle Fultz worked out with the #Sixers today even after his agent said he wouldn’t practice or play until he sees a shoulder specialist. Fultz participated in light shooting with teammates, according to league sources. The Sixers didn’t have a formal practice. As I documented all throughout last season, Fultz has continued to put up shots throughout periods in which the team labeled him unavailable, and with that appearing to happen once again, it only further severs the trust between a young player and pretty much every group of people with interest in him. It's worth noting for context: the Sixers did not make any of the players available to the media following our chat with Brand and Brown and kept the gym closed for the entire afternoon. We won't know how they feel about this out-of-nowhere response from Fultz and his agent until at least tomorrow night when the locker room opens for pre-game availability in South Philly. Their trust is inarguably more important than anyone else's, and Brown insisted he believes that bond is still in place. "I do not believe something like this warrants...because we are all kind of speculating," said Brown. "I get the dots that you are asking about and trying to connect, I understand that, but I don’t believe that so. I think that his stock and trust within the existing team is strong." Given the nature of how the organization found out about this, the GM's visible annoyance with the situation, and the obvious dot connecting that even Brown couldn't dismiss, I would say there's still a lot more to be uncovered here. The bottom line is this — even if the aim here is to rectify a legitimate issue Fultz is dealing with, shoulder or otherwise, the process to get here is so shoddy and so ill-timed that the public now has more reason trust the most criticized medical staff in the league than they do the player who will sit out (or maybe not) until further notice. You actually feel for the Sixers. They gave starter's minutes to a player who had done little to earn them to start the season, and at the first sign of the team starting to put the collective ahead of him — and rightfully so — the people around him pushed the panic button, putting them in an unwinnable situation. "Our definition of normal in this building and our program is probably different than most, and I’m personally fine with it," said Brown. "If the base is strong, and the culture is strong, and the belief and the things that we’re doing on-court, off-court are strong, then you can take things like this and move along." It will be up to Fultz and the people around him to prove he can move along, too. The signs don't look good.